The massive E-Crane being installed at MetalX in Delta is 60 feet from the operator’s seat and reaches over 100 feet. Nearly a year after its groundbreaking ceremony, a $50 million scrap processing plant still under construction in Delta has begun conducting business on a limited basis. MetalX, an Indiana-based company with six locations, began some processing operations in October on the 60-acre site on State Route 109, across from NatureFresh Farms. The state-of-the-art facility will process ferrous and non-ferrous scrap metal using a staging and distribution yard. The site will include a fleet transportation hub for suppliers. Tina Bobilya, marketing and public relations director, said an initial crew of 40 employees is currently working with scrap being shipped to the yard that doesn’t require as much processing as other types. “We’re conducting business from that location. As the functions become available, we’ll continue to expand,” she said. Installation of the facility’s E-Crane, a massive structure now visible from as far as the Ohio Turnpike, is almost complete. When operable, the crane will have a reach of more than 100 feet. It will feed scrap metal to the facility’s Mega Shredder, which is still under construction and will handle more than 500,000 tons annually. A non-ferrous warehouse is also still under construction, although exterior work is finished. Bobliya said MetalX will open gradually, expanding as the necessary scrap processing equipment is installed. About 100 people are expected to be hired by mid-2019, but heavy equipment operators are needed immediately. Applicants for all positions can send a resume to employment@metalx.net; they must specifically request the Delta West facility. 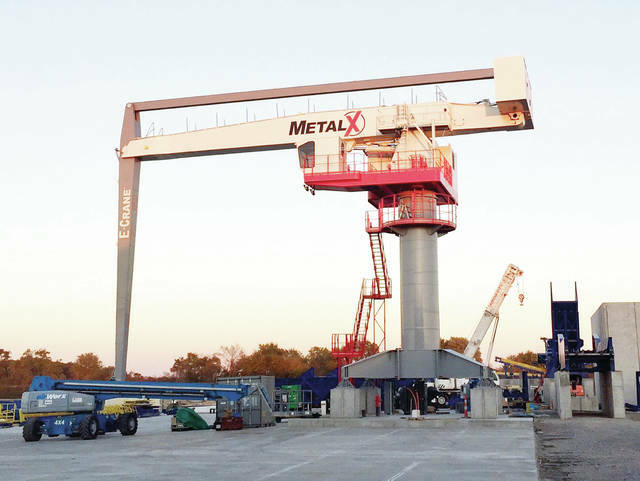 Bobliya said the raised E-Crane, deliveries of scrap metal to the facility, and activity in the yard are beginning to cause a stir locally. MetalX was founded in 2012 by Danny and Neal Rifkin. The privately-held business employs more than 250 people and has main processing plants located in northeast Indiana and northwest Ohio. It also provides consulting and management services across the United States. The company purchased M&K Metal Processors at 6946 County Road 5 in Delta in July of 2017. It was reopened as a branded MetalX operation concentrating on commercial businesses and community recycling.